A: For over 150 years standard fillings have been made out of a silvery-grey material called amalgam. This is still one of the strongest and longest-lasting materials available for fillings. However, many people find it unattractive and some are concerned about possible health risks. There are now alternatives to amalgam fillings, which may be suitable for use in some situations. The new dental materials mean it is much easier to find a perfect match for the shade of a particular tooth. In most cases, it is quite impossible to see the tooth even has a filling. A: Most people have fillings of one sort or another in their mouths. Nowadays fillings are not only functional, but can be natural looking as well. Many people don’t want silver fillings that show when they laugh or smile because they are more conscious about the way they look. 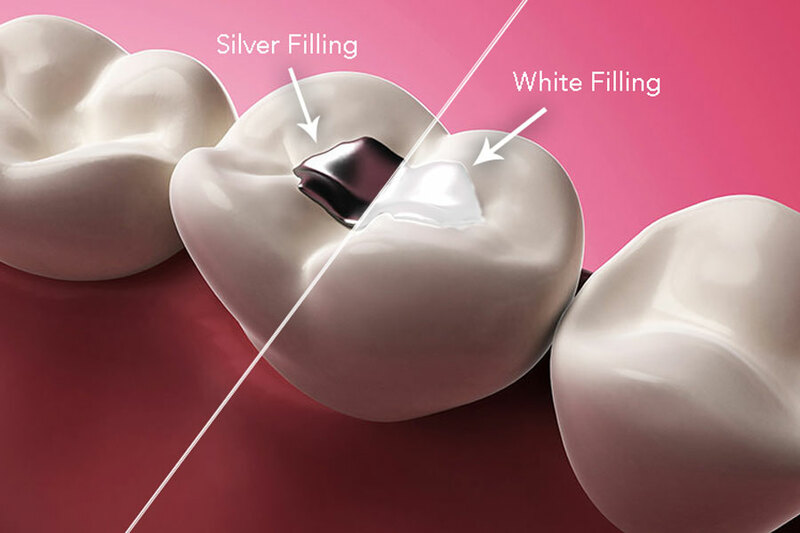 A: White fillings have always been considered less long lasting than silver amalgam fillings. But there are now new materials available with properties comparable to silver amalgam, and these are proving to be very successful. The life expectancy of a white filling can depend greatly on where it is in your mouth and how heavily your teeth come together when you bite. You will be advised on the suitability of your mouth for these new restorations. A: It is usually best to change fillings only when an old filling needs replacing. If this is the case you can ask to have it replaced in a tooth coloured material. It may not always be suitable to put white fillings in back teeth as they are not always successful. One way around this would be to use crowns or onlays, but this can mean removing more of the tooth and can be more expensive. Contact us for more information on white fillings or to schedule a FREE consultation session in Vancouver.